According to the newly released report, Glo Nigeria gained 214,646 new subscribers in the month of July, taking its customer base to over 40.3 million. Globacom’s addition of 214,646 subscribers constituted the largest gain by any operator in July. Airtel garnered the second most number of subscribers, as it added 149,880 new customers, growing from 39,898,448 in June to 40,048,328 in July. MTN and 9mobile, lost 999,891 and 246,221 subscribers, respectively. A further analysis of the NCC report showed that Globacom has added a total of 2,153,374 new subscribers this year. In terms of internet subscribers on mobile devices Globacom accounted for most of the growth during the review period. The total number of data users in the country rose by 866,656, from 102.81 million in June to103.67 million in July. Globacom took the lion share of 574,821 new internet users, with its data subscription rising from 26.57 million in June to 27.15 million in July. The addition represents 66 percent of the total of 866,656 new internet users in the industry. Airtel’s gained 375,724 internet users in July, while MTN gained 134,197 new data users in the same period. On the flip side, 9mobile lost 218,086 internet users in July, as its subscription base fell to 10.37 million as against June when it recorded 10.59 million. Globacom has rolled out a number of customer-friendly initiatives recently which may have significantly helped to grow its subscriber base. The operator launched Glo Yakata which offers up to 2,200 % bonus on every N100 recharge and above, and Oga SIM which offers 125 percent bonus on every data subscription. Note that Globacom has improved on its internet data speed to pursue its inactive subscribers. When Recharging 200 Naira Airtime. Your AWUf4U Airtime is for 14 days ( two weeks ). Get 20times value of your recharge from N100 - N1000 today. Recharge N100 & Get FREE N500 & 375MB data. Recharge N200 & Get FREE N1000 & 750MB. Talking made easy. Single Recharge of N100 or more gets you an additional N400 for calling all networks. Reply OK to this number 40411 and get this offer. READ ALSO: The Cheapest Internet Data Ever. Get 1 HOUR of free Airtel-to-Airtel calls ¡ only N100! Dial *341*101# NOW to enjoy. Valid for 1 day. Your recharge was successful. Dial *600# and get BACK DOUBLE whatever you use today FREE TOMORROW to browse, call, and SMS all networks. Dear Customer, Are you out of Airtime? get EXTRA CREDIT from Airtel and pay later. Just dial 14495 NOW. Valued Customer, Get extra credit for your CALLS, SMS and BROWSING. Just dial 14495 to borrow and pay later. Only 5 Days Left to get this UNBEATABLE DATA OFFER of 200MB for N200, instead of 100MB valid for 3 days! Hurry up and Dial *412*2# now, to activate from Airtel the smart phone network. the issue of the internet data subscription is a very serious one. recommended for lots of my readers too. speed and their reliability is above average. Globacom is the worst network in most areas, 9moble Ng is generally the most expensive, but also the fastest. Airtel is in the middle of the two divides. Not expensive, not the slowest, not the most reliable. Airtel The Smart Phone network. 6GB Worth of Data For Just N1,500 . and value for the money. otherwise the plan won’t work on your sim. ==> Airtel 100% data Offer:- This is not based on eligibility. 750Mb for N500, extra 1.5GB when you activate 1.5GB for N1000, extra 3.5GB when you activate 3.5GB for N2000. are a business person or you spend most of your time on the internet. Unlimited 20. All you need is to buy a new sim, activate the Unlimited 20 and you will be given Airtel MiFi/Router for free plus more data and validity date extension. Visit the nearest Airtel Shop to enjoy these unbeatable offers. you how you get 200% Data Bonus! With N500 you can get 3.2GB while 7.2GB will cost you just N1000 and 24GB for N3000. "woaw"
N1000 instead of 1.6GB. All Glo subscribers can enjoy the offer, both new and existing customers are eligible. All you have to do is to log on to their website: https://www.quickteller.com "
just head straight to the web version of the site Click on data and choose Glo data bundle Choose your preferred data plan. GLO data and its expiration date. topping up your data balance from Glo, making a total of 200% data bonus. Enjoy! or the 100% data bonus that is currently ongoing on Airtel network. per month on data before this can be profitable to you. you from frustration while not breaking your pocket. N2,000, for 5GB of data to browse the internet and download from 7PM to 6.59AM weekdays for 30 days. access Whatsapp 24hrs a day (weekdays and weekends). It seems the 9mobile YouTube free 2GB daily is no longer works for 500 naira monthly plan. if you really want to benefit from the free Youtube free night data. how to get it done here. videos on YouTube for 2 hours, but by the power vested in AnonyTun VPN, you will be able to browse and download anything you like. terms of data calculation and consumption. MTN, Glo, Etisalat and Airtel now allows subscribers to borrow Airtime (Credit) at any point in time when you run out of airtime and I will be giving out the codes to dial in order to borrow credit from any of the network providers in Nigeria. Some of you might be aware of the code to borrow Airtime from your preferred network but what about other networks? NOTE, one day, you might need the same service on another network that you are not conversant with. I will advise you to bookmark or save this page for reference purposes in future so that you can easily open it anytime you want to borrow airtime from a network you forgot their codes. This service has saved many people in some tight corners when they don't have money to buy airtime or don't have access to where they can purchase airtime. It is making like more easier than before. Without wasting much time, follow the procedures below to borrow airtime from any network in Nigeria. 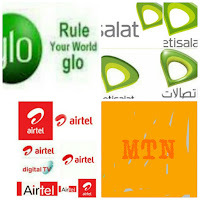 The service is exclusively available to prepaid subscribers who recharge at least N500 monthly. To borrow Airtime/Credit from MTN Dial *606# and follow the on-screen instructions Alternatively, you can dial *600*amount# or you dial *600# and follow the instructions. Do you know you can also borrow data from MTN? Ok click here for more information. Etisalat has increased their charge to 10% and 15% but if you are okay with that and still want to borrow credit, then Dial *665*amount#. For example if you want to borrow N100 airtime from Etisalat you will have to dial*665*100# Also note that the service will attract a 10% charge from your next recharge. That is, if you borrow N100 airtime, your phone will be credited with N90 on your next N100 recharge. Alternatively, you can Dial *665# and follow the on-screen instructions. SEE ALSO: Codes To Buy MTN, Etisalat, Glo, Airtel Airtime From Your Bank Account. The amount you will receive should be less 10% as service charge. That is, if you request for N200 credit, your phone will be credited with N180 while N20 goes to Glo as their service charge. Step 1: Create a 4 digits pin. On your Glo sim, Dial *321# then create a 4 digit pin of your choice e.g 4571. For you to be eligible to borrow airtime from airtel, you need to be a regular subscriber on Airtel for at least 3 months and must load a minimum of N100 monthly before you can borrow. To borrow airtime from Airtel Dial *500*amount# That's how you can borrow airtime from any network provider in Nigeria. Kindly hit the SHARE button to share with friends on Facebook, WhatsApp, Twitter, Google+ etc.